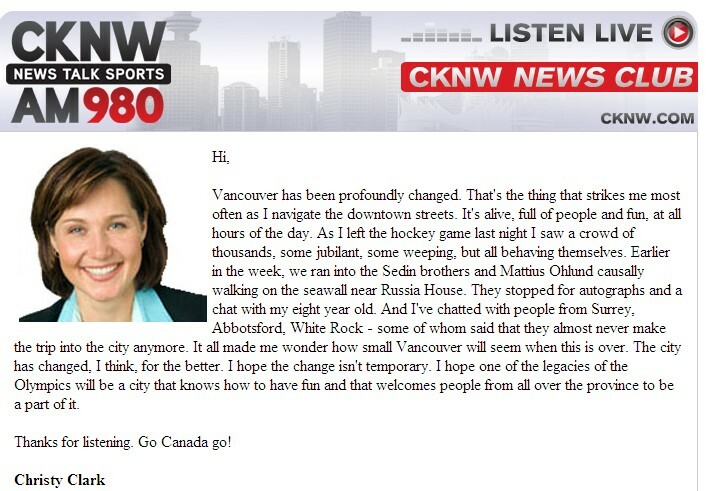 “Vancouver has been profoundly changed,” according to local talk radio host and former BC cabinet minister Christy Clark. We’re just over halfway through the 2010 Winter Olympic Games here in Vancouver, British Columbia and Clark’s comments will not be the only ones proclaiming a new era for the city. In the lead up to the games, Olympics advocates, including the provincial and federal governments, the Vancouver Olympic Organizing Committee, and local real estate bureaus spent a lot of time and money trying to convince the public that hosting the 2010 Winter Olympic Games would bring great benefits to Vancouver and change the city. BC Premier Gordon Campbell predicted in the Vancouver Sun in January 2003 that “hosting the Olympic Games will provide lasting benefits for all British Columbians today and for generations to come,” (13 Jan 2003, p. C1). At least 63% of Vancouver electors were convinced. Historians will, no doubt, debate the significance and impact of the 2010 Winter Olympic Games in Vancouver for years to come. One thing we can see now is that the promotion of Vancouver through the Olympics is part of a much longer historical trend of boosterism in British Columbia.